This is a 24.44-carat emerald cut owned by Robert Mouawad. It's current estimated value is over $20 million. 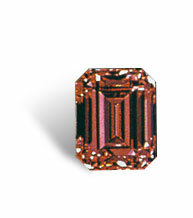 The exact color grade and clarity has not been published, but it due to its name and the photo, it is safe to say the stone has a higher color saturation than the Mouawad Pink Diamond. On June 5th, 1976 the stone was offered at auction at Sotheby Parke Bernet's Zurich location. Featured on page 476 of Art at Auction: the Year at Sotheby Parke Bernet 1975-76, it had an estimate of 2,700,000 Swiss francs, equal to £600,000, or $1,088,710 US.